Have you ever experienced rude grocery shoppers who cut you off to get the closest parking space or rammed their cart into you because they were too engrossed in whatever was happening on their cell phone? Or worse, have you ever been that person? 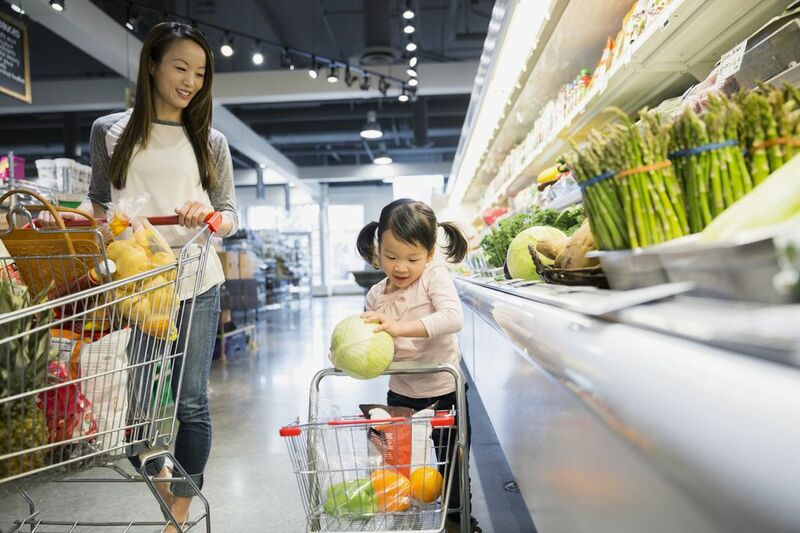 Since almost every adult has to shop for food periodically, why not make it a more positive experience? All it takes is knowing and following some basic good manners. When people leave the house, regardless of where they're going, they need to think about manners. Most people understand the importance of good behavior at the office or even at parties. Manners at the store are just as important. Finding a parking space in the grocery store lot can be a harrowing experience, particularly late in the afternoon when people shop after work or on a Saturday morning. When you find a spot, pull into it and make sure you are between the lines. Don’t park diagonally across two spaces to prevent door dings. That’s rude and might make the wrong person angry enough to give you more than a door ding. If you choose to shop during the store’s busy times, put on your walking shoes and pick a spot at the far end of the lot. That will save you a lot of grief and aggravation since you won’t be one of three or four people racing for the same spot by the door. The bonus of parking a farther distance will be the extra calories you’ll burn. The next place where you might find etiquette conflict is in the grocery cart corral. Most grocery stores have plenty to go around, so if you see someone racing you to a cart, let her have it and take the next one. Or better yet, pull it out and offer it to her before getting one for yourself. When you are finished with your cart, remove all tissues, wrappers, bags, and other trash before returning it. Even if the store has personnel who do that, you should still show some civility and not leave them with a mess. Most grocery store aisles aren’t wide enough to have two carts parked side by side with enough room for another one to pass. Be considerate and position yours so others can get around you. If you are in the middle of a conversation with another customer, choose a spot that won’t be in someone else’s way. Honor other customers’ personal space and don’t crowd them. While shopping in the produce section, take your time choosing your vegetables and fruits, but remember that there are others who want to do the same thing. Inspect what you need and then move on so that someone else can make a selection. When you need to test for ripeness, give the item a gentle squeeze but not hard enough to bruise it. Prices are already high enough. You don’t want to exacerbate the problem by adding to the unsalable products. Any time you remove an item from the shelf to read the label, either place it in your cart or put it back where it belongs. Putting it in the wrong spot covers another item and makes shopping difficult for others. Never remove something from the freezer section and discard it on a regular shelf or at the register. Ice cream and other frozen items will melt and destroy anything you put them on. Most adults have to shop with small children at some point in their lives. Before taking them shopping, give them a lesson in manners, and don’t hesitate to repeat the rules of good behavior. Don’t be afraid to use bribes if it means having a peaceful shopping experience and not annoying other customers. If your child starts to have a temper tantrum, remove him or her from the store. The checkout area of any grocery store can be a war zone when people aren’t considerate. Why not take the attitude that “we’re all in this together” and have a good laugh when it’s crowded. After all, everyone who shops has to go through the line to pay for the groceries. As you shop, you are likely to find yourself faced with unique experiences that might rattle your nerves. When that happens, stop for a moment, take a deep breath, and find some sort of peace with the situation. If you are ever in doubt about what to do, employ the Golden Rule.